Concealed from the world and located just off the north-western tip of Chief's Island, is the secret paradise of Mombo. Occasionally an island of its own, sometimes linked to Chiefs Island, the region is relentlessly modified by the ebb and flow of the delta's waters. 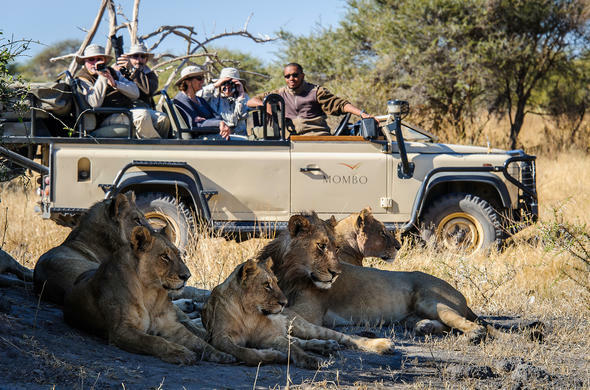 Mombo Camp is positioned deep within Moremi, underneath huge trees on the edge of a broad floodplain.Take a game drive in a 4x4 vehicle to explore the area - Elephant, Buffalo, Leopard, Cheetah and all the other major predators are customary in the region. A large pack of wild dog visit the area around the camp and have successfully raised large litters in recent years.Birdlife is abundant, with waterfowl and waders being predominantly common. As a year-round elite wildlife destination (especially for predators), Mombo has a record unequalled in Africa. This area provides one of the utmost quality wildlife viewing opportunities on earth. Mombo Camp is built on a scenic island where large concentrations of wildlife of many different species can be viewed from the luxury of your veranda! Giant umbrella thorns and Ilala palms dot the expansive plains to establish a glorious savannah landscape alongside the marshes and floodplains of the Delta.Kwetsani Island is a large, extended island surrounded by enormous open plains. It is to be found in the Jao Reserve to the west of Mombo and the Moremi Game Reserve. The island is deeply wooded with palm, mangosteen and fig trees. The camp rests on stilts beneath the shady canopy, overlooking the flood plains. The water levels around the island transform each year, depending on the extent of the annual floods from central Africa. The water levels are at the highest from April or May to September each year. Activities at Mombo include morning and afternoon game drives in open 4x4 Land Rovers. The game viewing in the area is exceptional. Lion, Leopard, large herds of Buffalo, Cheetah, Wild Dog, Elephant, Hyena, Giraffe, Wildebeest and Zebra are frequently spotted. Short midday foot trails may also be undertaken to experience nature in close proximity. 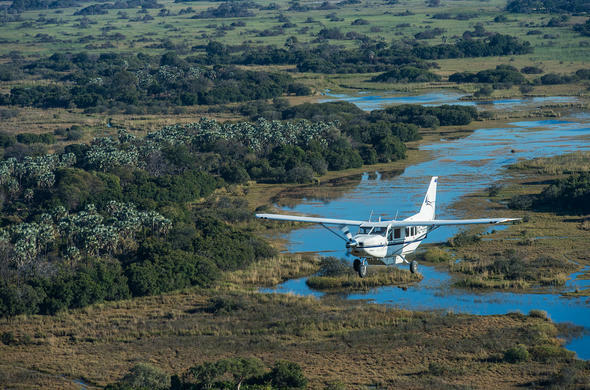 Access into this area is only by aircraft.Kwetsani offers excellent land and water activities, with much of the focus depending on the water levels from the region's annual flood. In addition to stalking game by mokoro, you will also be able to take pleasure in exploring palm-fringed islands on foot. 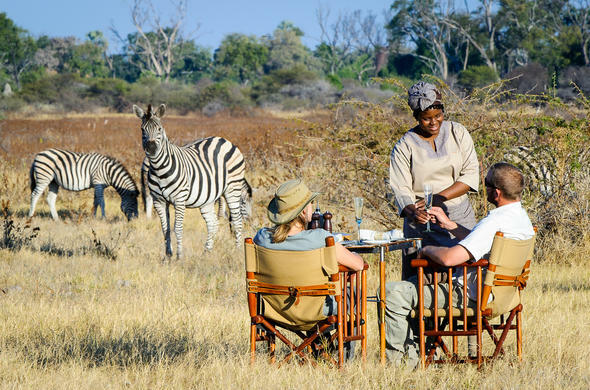 Day game drives are a highlight, enabling guests to experience varied and diverse game viewing. Guests have excellent chances of spotting predators during the day as well as on night drives. Recently refurbished, the camp offers lavish tented accommodation. New Mombo has nine tents and Little Mombo has only three. Whichever camp one stays in personal attention and service is assured. All the tents are raised on platforms, have proper doors, private bathrooms, additional outside showers, and ceiling fans.The communal areas include a lounge, bar and dining room, as well as a plunge pool for a cooling dip. The 'kgotla' is the protected outdoor area where you will dine under the wide star-spangled night sky, and take pleasure in the safari tales and reminiscing about the excitements of the day. Both camps jointly accommodate a total of 24 guests, but they are divided into two smaller camps - a 6 bedder and an 18 bedder.The guest's rooms and the walkways that link up the rooms to the living areas, are up to 2m off the ground, allowing game to meander freely through the camp - but at the same time allowing for guest protection. 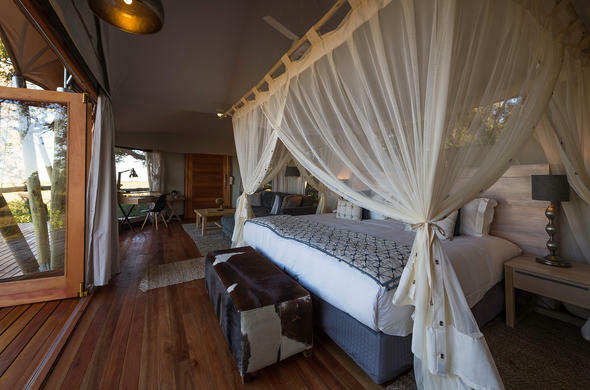 Facilities at Mombo Camp and Little Mombo include 9 and 3 large guest rooms respectively.These are splendidly furnished, large luxury tents - the most upmarket in the whole Wilderness portfolio. All rooms are built in the same style. The canvas rooms are roomy and well appointed and have en-suite facilities under canvas and an additional outdoor shower for those who enjoy a shower under the stars. 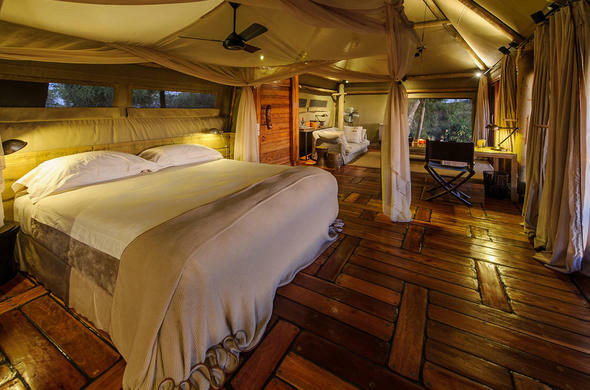 The tents are luxurious and are positioned on raised decks with verandas overlooking the surrounding plains. They include en-suite bathrooms with showers inside the tents and also outdoors. They also hold separate flush toilets and fans. The entrance to the tents have doors instead of zips. Soaps, shampoos and insect repellents are supplied in each room. Kwetsani Camp is a small, cosy, ten-bedded luxury tented camp and is raised on wooden decks above the lush ground vegetation. The five spacious and extravagant 'tree-house' chalets are built under thatched roofs and have canvas and reed walls. En-suite facilities under thatch include a shower, flush toilet, and basin, with an additional outdoor shower. The rooms have an open, airy feel about them, with a fantastic view of the surrounding plains. The dining room, lounge and pub area is situated under cool thatch. Mombo and little mumbo are situated just off the north~western tip of Chiefs Island within the Moremi Game Reserve.